The bridal shower game has traditionally been part of the entertainment. Your choice should add to your guests' enjoyment. 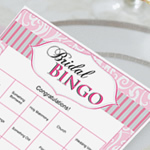 Bridal shower games can get the conversation flowing, and help guests feel relaxed. This in turn, often adds to the success of the party. The number of activities used will depend on the length of the shower, and sometimes the type. For instance, a sit-down meal will keep your guests occupied for a longer period of time than simple snacks. Generally speaking, two to four games is plenty. 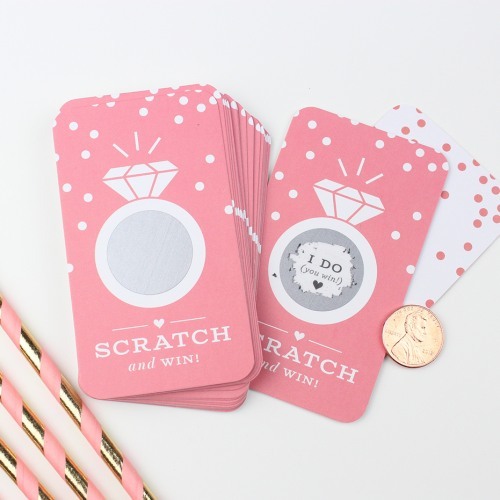 *** Have a favorite bridal shower game? Share it! What kind of bridal shower games are there? There are all type of activities. Some have questions and answers. Some require active participation like Charades or dancing, while others are sedentary. Some theme based ideas use props. You need to consider the atmosphere you're trying to create and whether you are trying to coordinate with a particular theme. • Pictured above are some of the many fun options. 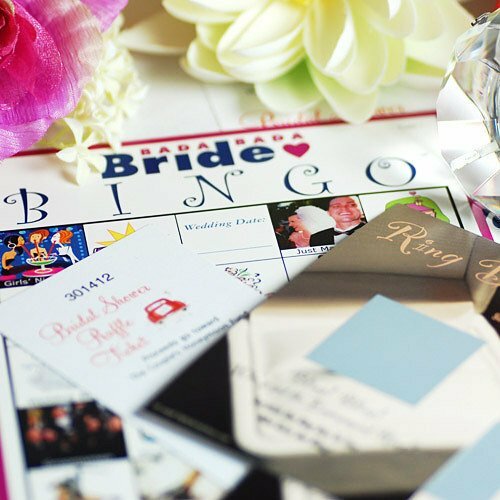 Guests are given a bridal shower bingo game template upon arrival. The spaces are printed with wedding related words and symbols. Each guest will have a unique set of items. Fill a row, or fill the whole card...you decide. • Bridal Shower Trivia: Guests test their knowledge of wedding traditions and love themed facts. Who will get the most correct answers in the quickest time frame? • What's She Thinking? : Scenarios involving the bride are presented. Multiple choice answers are given relating to movies or songs. Guests have to guess what the bride would choose. • Consider the ages of your guests. • Never make anyone feel uncomfortable. • Keep it light and simple. • Try to do something that includes everyone. • Bridal gift bingo is played as the bride opens her gifts. She announces each one, and the guests check their cards. The words can be generic gifts such as towels, sheets, etc. You may also use specific words if you are having a theme party. It is played like regular bingo, with the spaces being filled on each guest's card as the word is called. You decide how much of the card to fill. • Who Really Knows the Bride? Prepare 10-15 questions ahead of time, that relate to the bride. For example, what is her favorite food, color, movie, book, etc. The guest with the most correct answers wins. Mix up twenty words associated with brides, and have guests unscramble them. For example, church could be "urcchh", and groom could be "oomrg". The guest who unscrambles all the words first, wins. Have the bride leave the room, then ask specific questions about her. What type of shoes was she wearing? Did she have a sweater on? Was anything in her hair? Be creative. It sounds simple, but many guests will have been busy chatting, and will have to give some real thought to the answers. The guest with the most correct, wins. Prizes given are usually decided by the host. There can be one or more prizes awarded per game, depending on the number of guests and type of activity being played. Prizes that coordinate with the theme are a great way to add personality to your party. Items are available in a variety of price ranges. Remember this is a fun extra, so stay within your budget. .• Do you need some wedding shower prize ideas? Are you planning a couples shower? Do you need some tips for this part of the event? • Read about coed bridal shower activities. 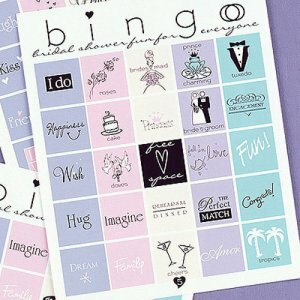 Have any Favorite Bridal Shower Games? Have any great ideas for bridal shower games? Did you play a game at a party that everyone thought was fun? Share it! Do you have a picture of your game being played at the shower? Great! Click the button and find it on your computer. Then select it. • Make sure to visit Diva Girl Parties and Stuff for fun, interactive and relationship-building games and activities to add lasting memories to your next bridal shower.